wedge or kakari for white? Alex: Thad, there's no nice way to say this. I have to agree with Dieter - most of your diagrams are simply wrong. Did you do any research before answering? There's nothing wrong with posting "well, I don't know, but this is how I would play" diagrams, but you should always make it clear that that's what they are, not an accepted sequence you know from books/pattern search on Gobase or GoGoD/talking to a pro/etc. Since you don't say anything of the sort here, a weaker player would probably assume you know what you're talking about, unless someone stronger (Dieter, in this case) comes along and points out that you're wrong. It's irresponsible to mislead people in this way. Please refrain from setting yourself up as an authority unless you've done the research to back up your assertions. There was a certain other user who did this chronically a few months back and it had many of us tearing our hair out. We don't want a repeat. Bill: Hey, wait a second, Alex! I took a look at the page history. The original poster asked for suggestions, and Thad gave some. He did not set himself up as an authority, but expressed his opinions, and identified himself as the author of those opinions. What are we saying, only dan players offer opinions? Alex: No, of course I don't think only dan players can offer their opinions. I just think that anyone's opinions should be labelled as such. If I write anything that's purely out of my head, it starts with "My instinct would be," or "Maybe," or "I don't know for sure, but I think" or something of the sort. If I write something that doesn't start like that, it's because it's based on research of some form or another - I'm looking at a joseki, or paraphrasing something I read in a book, or doing a pattern search on Gobase to see what the pros play in similar cases. I think most of the other dans here do the same. Maybe Thad wasn't intentionally setting himself up as an authority (certainly not to the extent that the "certain other user" I refer to did), but his words sounded like assertion to me, rather than speculation. If everyone starts voicing their opinions without letting the reader know how certain or uncertain they are, then every comment requires the reader to take a look at the author's home page and other writings in order to decide how many grains of salt to take it with - the ideas that actually have facts to back them up get lost in the noise. Of course, you could argue that things should work the other way - that unqualified speculation should be taken implicitly as such and that arguments that have research to back them up should provide the references. I think things would get too formal and academic that way, though. zinger: I agree that it is easy to misunderstand the intent of a poster in this way, discerning opinions and speculation from "facts". I myself made a miscommunication of this type in BQM213. Dieter: I agree with Bill. I posted my diagrams in the same authoritative way as Thad. Maybe the requester will find my suggestions more plausible than Thad's, maybe not. Maybe the requester will take rank difference as an argument for believing who's right. I see Thad's suggestions as justified contributions, though subject to discussion. My contributions are debatable too, and I can only hope they are valuable. This is a BQM. 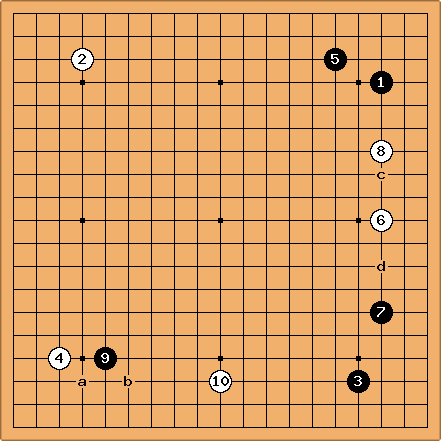 It's different when reference pages such as joseki, or technique, are cluttered with all kinds of strange plays. dnerra: Maybe it is worth everyone reminding that there are NO authorities on SL. We just learned that for Benjamin, 4 weeks in a Baduk school were not enough to learn the basics. Now, Benjamin is about 2 stones than the strongest regular contributors here. Alex: You all make good points. I'll admit to overreacting. As someone who's started many a lengthy BQM discussion, I know very well the value of everyone putting in their two cents, regardless of strength. I still think that the library would be more useful if people communicated their level of certainty (or lack thereof) in their ideas more clearly. Although there are no true authorities on SL, as dnerra says, there are varying levels of strength and varying levels of complexity of questions. A 20 kyu asking a question might not be able to tell if it's simple enough for say a 10 kyu to answer or whether a dan's (or even a professional's) opinion would be needed to answer it adequately. The 10 kyu, however, SHOULD know whether the question is within his ability to answer with a reasonable degree of certainty, and be modest enough to say so when responding. We dans frequently answer questions that are above our heads, simply because there are no top amateurs or professionals available on the library to answer them, but we tend to be careful to let people know when we feel our answers are iffy. Steve (6k): Surely the simplest way to attach a measure of "I know what I'm talking about" to your suggestions, is by attaching your rank when you're giving your opinion, as I've done here - something I've often seen elsewhere on SL. Alex: I think you're missing the point a bit, Steve. Although knowing someone's rank is often helpful in judging how much weight to give their opinion, it isn't that simple. It also depends on what the strong points of your game are, what books you've read, etc. For instance, on questions of good shape or fuseki, I'm probably a pretty good bet, but if I take a stab at a life and death or endgame problem, you might be better off trusting a 5 kyu who does lots of tsumego, even though our ranks would suggest otherwise. The important thing is that people learn to be honest with themselves and others about what they know and don't know - when their opinion is based on facts learned from a reliable source or by thorough reading, and when it's just "well, this is what I would probably play in a game." Gauging degree of authority by rank alone encourages the opposite - the attitude of "Don't question me, I'm five ranks stronger than you." Bill: On the main page the questioner asks for a plan for White. I think that it is hard to give one because White is already in trouble. The previous play has been posted below. Let me make some comments to show what I mean. Bill: is questionable, as it invites , which has a good relation with . Better at a.
is also questionable, as it allows for a second shimari. also threatens . Better at . is also questionable. It is not urgent. Even if Black plays c, White has room for d. Better at b, making an enclosure and preventing . is also questionable. White's play is too lax. Are you certain this is correct, or is this a matter of style? Bill: Certain? These are only my opinions. If you look only at the bottom side, I think that is playable. I'm sure that I have sometimes played it. But White's play is too lax. White is playing where the stones make the loudest noise. Bob McGuigan: I think is slack even looking only at the bottom side. With a four-space separation, puts almost no pressure on , and isn't even a pincer on because it is low and far away. Black can respond at the point in the next diagram, build some thickness in the lower left and leave White with the dilemma of whether to defend or allow Black to play in the upper left. Bill: is a little close. So is probably better at, say, , or as a kakari in the top left corner. The result of - is to make Black overconcentrated, but White is low. 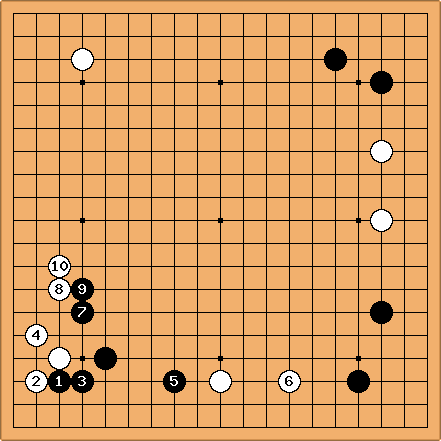 Bill: White has managed to get no enclosure, while Black has two. is also lax. Fortunately looks ill placed. Still, White has fallen behind. You mean relative to where white could have been? White starts off behind. If you give white two moves in a row at this point, is white still losing? Alex: Assuming there is komi, White does not start off behind. And yes, I believe Bill means that White has fallen behind more than 6.5 points on the board. I agree with him. Bill: I was assuming komi. And I do not think that White has fallen a whole stone behind. But also consider the manner in which White has fallen behind. What are White's prospects? Where is Black's weakness? Fortunately, gives White some chances. Fight fiercely! Andy Pierce: White's plan was to not let black get a moyo. Someone said it's better to have a bad plan, than no plan. Is there a go term for achieving your goal and still failing? I agree that was poorly placed. The rest looks not too bad to me though. I managed to shut myself off in the top left, which I thought really set me back (and lead to this BQM), but managed to struggle back to a pretty good position when I misread a sequence to seal a loss. Where do the pros play in this position? Note on the wedge (d): You can't say much with only three examples, but in all cases the other corners were settled, at least with a 3-3 or 4-4. Alex: Yeah, I was going to say before (but someone else was editing at the time and I forgot to come back) that I think the approach is played much more than the wedge. The conventional wisdom is that you shouldn't let your opponent make two shimari. Not only that, but the wedge allows Black to make his second shimari as a checking extension. I'd be very hesitant to play that way as White. Still, if the pros have played it, even only three times, it must not be completely horrible.